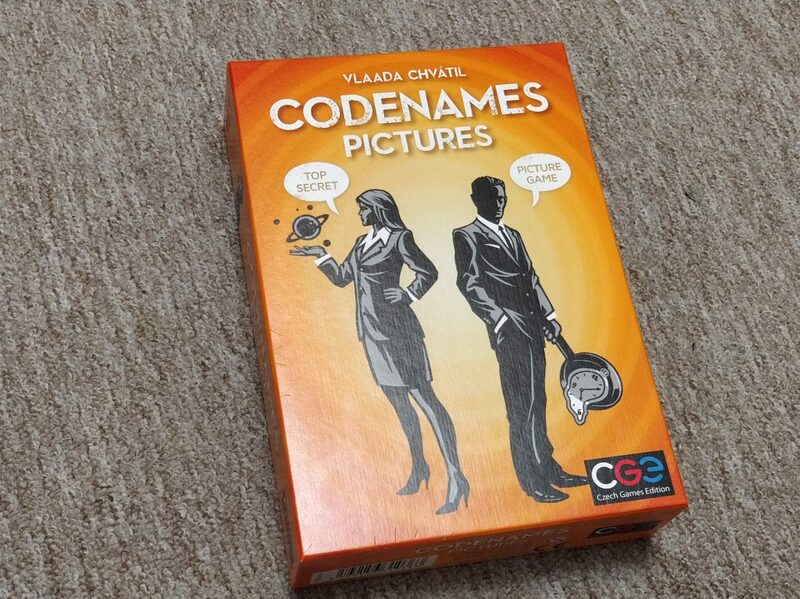 For this month’s Boardgames Club we have been playing “Codenames: Pictures” – a fun game that’s challenging enough for age 10+ but not too difficult that you’ll be put off. The story of the game is that the spymaster(s) have to help their field operative(s) locate their spies on the map by giving clues relating to special picture messages – but make sure they don’t accidentally locate the assassin! Don’t worry if that doesn’t make much sense – the instructions in the game are very clear and talk you through what to do. The packaging says it is for 2-8+ players (but 4-8+ player to play competitively) – there are three of us so we had to play a slight variation and we also tried the two player game too. The game is played with 2 teams – a red team and a blue team. One player from each team in the Spymaster and the others are Field Operatives. In the three player game you have two Spymasters and one Field Operative who works for both teams. 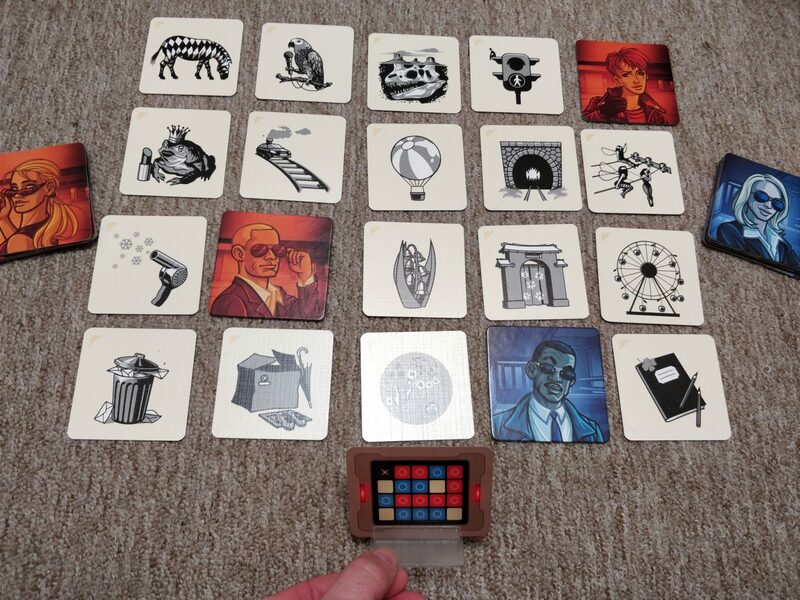 To set the game up you lay out 20 of the 140 double-sided picture cards in a 5×4 grid and the Spymasters have a ‘Key’ card which is placed in the included stand. 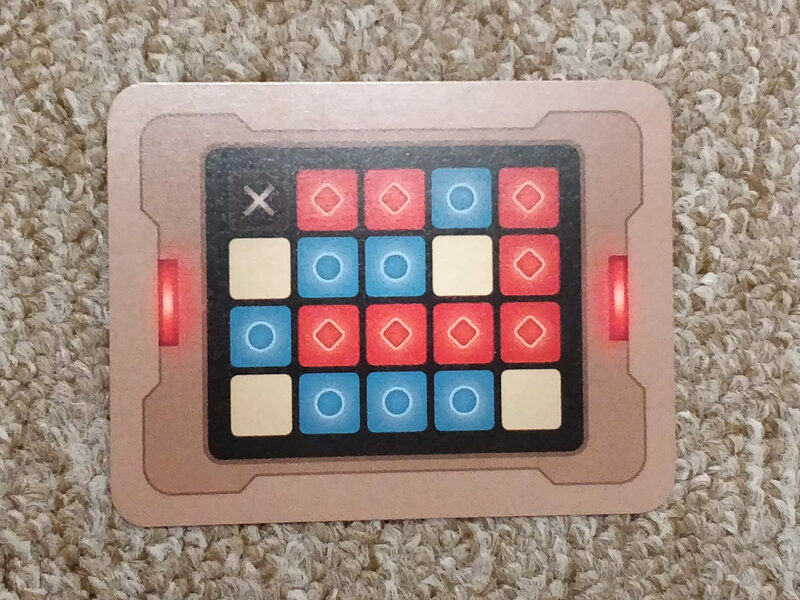 The Key card relates to the layout of the picture cards so if the top left square of the key is red then the top left picture card is red – although the Field Operatives don’t know this. The aim of the game is for the Spymasters to give a clue about 1 or more of the pictures so the Field Operative can guess the pictures that are their team’s colour. This is where the fun begins and you need to use some ‘out of the box’ thinking. 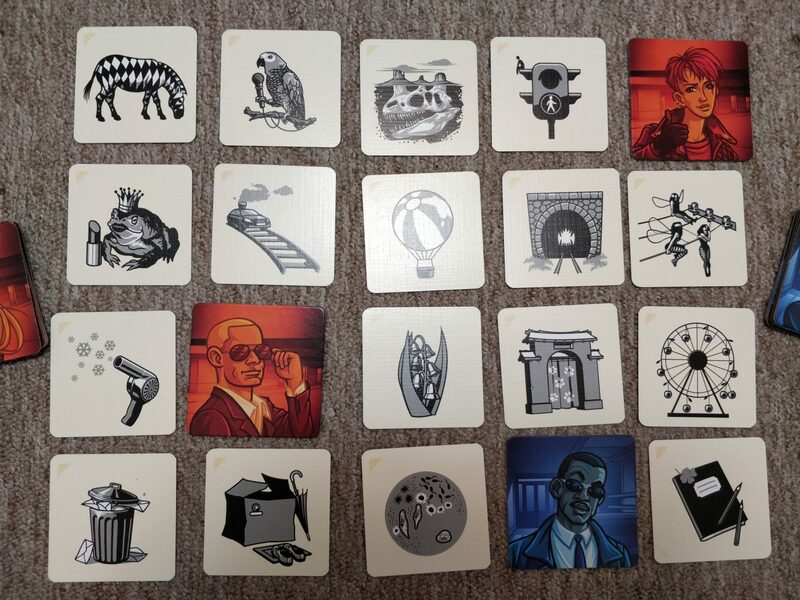 The Spymaster can describe as many pictures as they want but only with a single word as the clue along with stating how many pictures they are referring to. So you could say ‘animal – 2’ which would mean there are 2 pictures linked to the word ‘animal’ that need to be guessed. 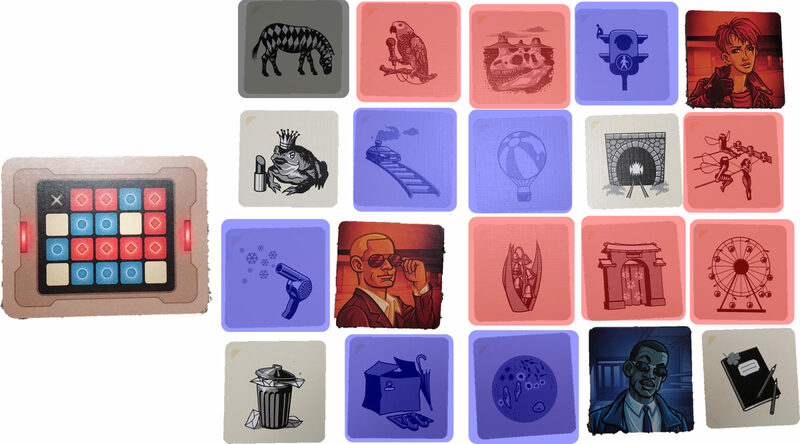 But the clue-giver must make sure that the clue is unique enough so the Field Operative doesn’t accidentally pick a card from the other team. Oh, and the pictures aren’t straight forward either – a teddy bear in a prison outfit, a hairdryer blowing snowflakes, a parrot on a branch holding a microphone, a car on a train track and a leaf with a kite’s tail. Those are just a few examples. The ‘weirdness’ aspect of the pictures, however, is what makes it possible to link multiple pictures to the same clue – for example ‘plant’ could be a clue for the parrot and the kite but, equally, the parrot could be linked with the hairdryer with the clue ‘loud’. So, assume it is the Blue team’s turn – the remaining squares are highlighted above. I could say “Traffic – 3” which would relate to the traffic lights on the top row and the car on the train track and hot air balloon on the 2nd row. Hopefully the Field Operative would guess these 3 correctly. However, there is a risk that the Field Operative will select the train tunnel on the 2nd row which would end the turn by finding a neutral card. I would try to avoid anything that hinted at the zebra for the clue as the black square is the assassin which ends the game! So the red team would need to avoid words like ‘animal’ when describing the parrot or dinosaur fossil. The winner of the game is the first to help the Field Operative locate all their agents but if you locate the assassin then that team loses instantly. It is a fun game with enough variation that it’s highly unlikely that any two games will ever be the same. Play time is around 10-15 minutes so it’s good for a quick time killer but you can also play multiple games and keep track of scores if you had more time. 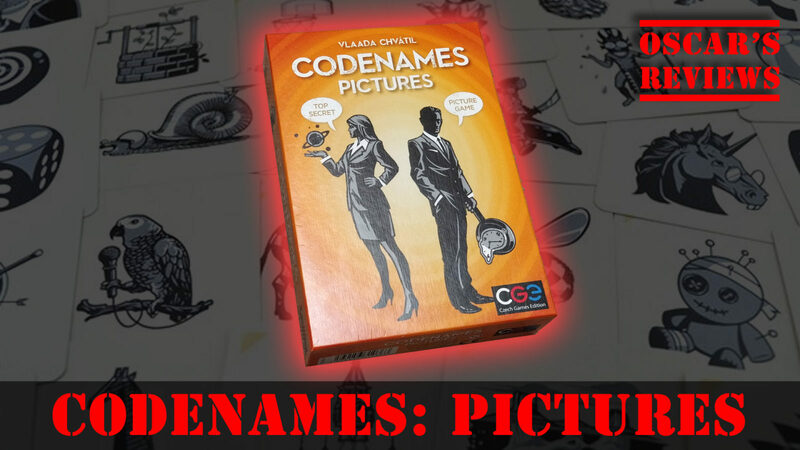 Overall, we really liked “Codenames: Pictures” and would recommend it for those wanting something a bit different to a traditional guessing game or board game. 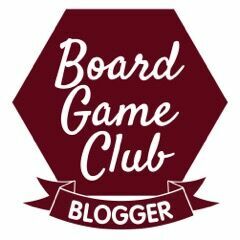 Disclaimer: We were sent the game free of charge as part of the “Asmodee UK Blogger Board Game Club”. All thoughts and opinions are our own.